With 9380 ft. Bald Mountain is the tallest peak of the Groom Range, the mountain range between Area 51 and the town of Rachel. The top of Bald Mountain overlooks most of Tikaboo Valley, Sand Spring Valley and Emigrant Valley, where Area 51 is located. It used to be on public land until 1984, when the restricted area was extended to include the northern part of Groom Lake and almost the entire Groom Range. 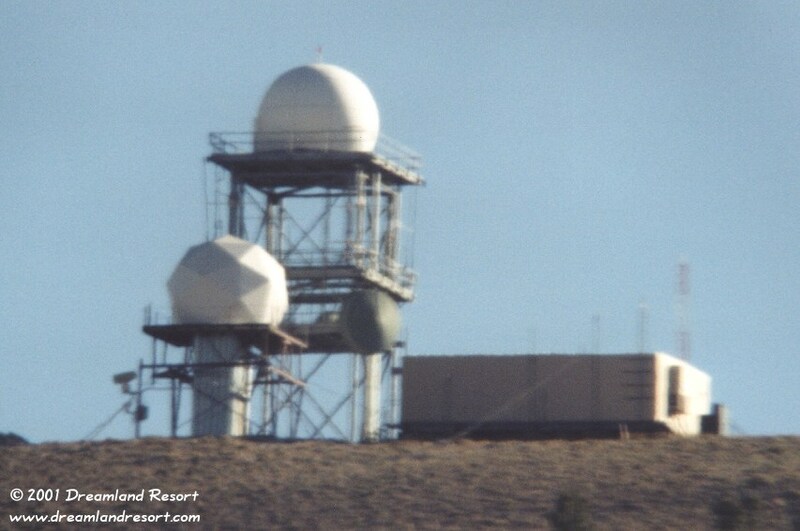 In October of 1995, at about the same time when White Sides and Freedom Ridge were taken, a radar station on top of Bald Mountain was completed. Its white radar domes can easily be seen from most locations in both valleys. In October 2000 a new, smaller radar facility with another dome was added about 0.2 miles northeast of the original facility, on a slightly lower peak. New satellite images show that both sites are connected with an above-ground cable conduit (see last photo below). Red lights, easily visible to the naked eye at night, were mounted on top of the two main radar domes. There is a service building near the original domes, but the station is believed to be unmanned and fully remote controlled. Only occasionally the Pave Hawk helicopter can be seen flying service personnel up there. There is at least one large remote controlled surveillance camera mounted to one of the towers. We have seen it pointed in different directions, and it can probably cover the entire valley. This camera is much larger than the surveillance cameras that you can see at some of the gates, indicating that it has more powerful optics. Some speculate that the site may include even more high-tech surveillance equipment, such as laser microphones, able to pick up conversations in vehicles driving by on Hwy. 375. The technology exists, but if it is really used here is unknown. Our photos below show no evidence of such devices, except for the surveillance camera. 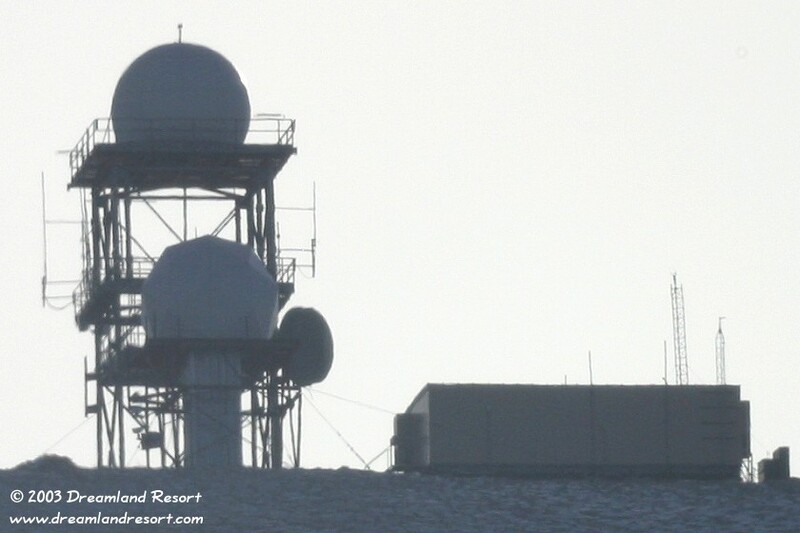 The GPS coordinates of the tallest radar dome are: N 37° 26.944' / W 115° 44.030'. 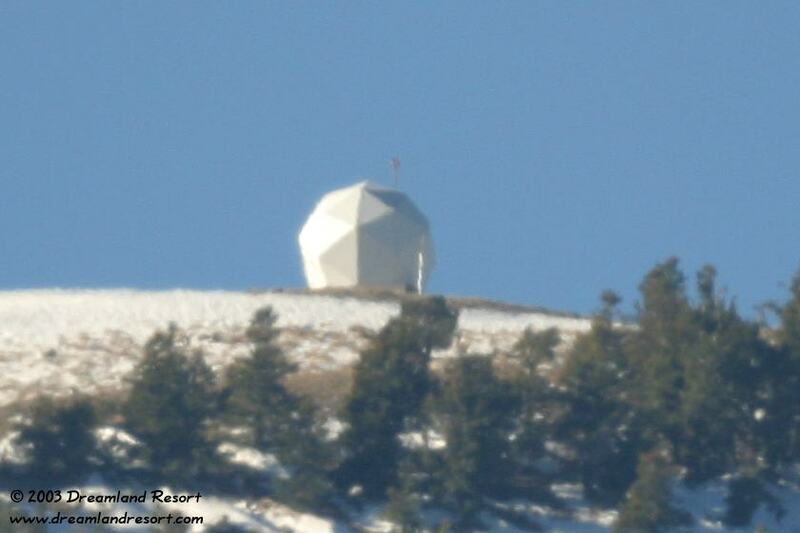 The newer dome is at: N 37° 27.098' / W 115° 44.113'. The most obvious being a radar station with now three independent radar domes. The fact that the third dome was constructed away from the other two would indicate that it could interfere with the operation of the other two, or vice versa. The facility is also used as a main relay station for the surveillance cameras, road sensors and other transmitters scattered across the valley. Most of the dish antennas of the surveillance cameras point to Bald Mountain. 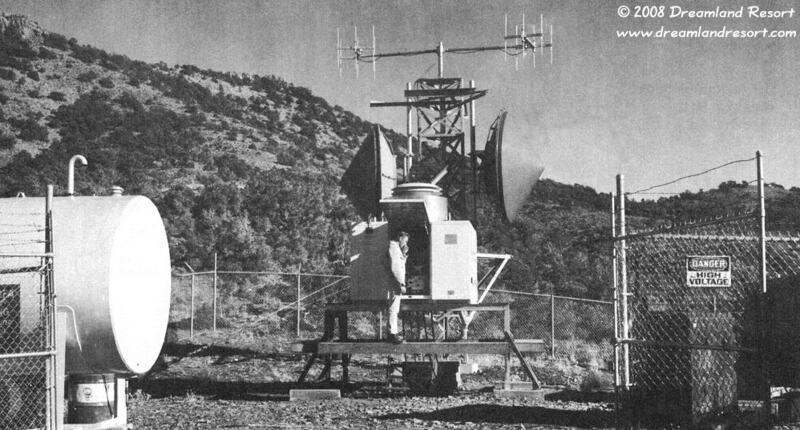 It is also connected via microwave link to a similar radar site on Halligan Mesa near Basecamp. One of the digitally encrypted trunking sites of the new Area 51 security radio system is located here. With the remote-controlled camera the station is also part of the surveillance system for Tikaboo Valley. Contrary to a common misconception there is no evidence for a connection to the Mount Irish Radio Site. Bald Mountain seen from the back, from the Area 51 North Gate. The old installation is on the right, and the new dome on the left (north). Photo taken 12/03/2002 by Chuck Clark. With friendly permission. 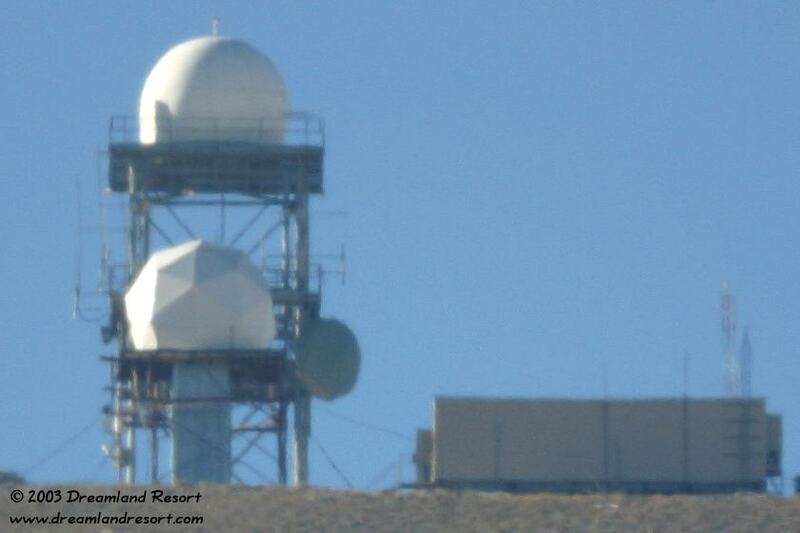 Close-up of the Bald Mountain radar installation. You can see the two large radar domes of the original installation and a large service building that houses the electronics. Mounted to the tower are various types of antennas, and at least two cameras on the front corner of the lower tower. At least one of the cameras can be moved via remote control. The large dish is a microwave relay, probably to a similar site on Halligan Mesa, or possibly to a smaller site near Warm Springs. Photo taken 1/1/2003 by Chuck Clark. With friendly permission. Another close-up of the same installation, taken from a position NNE on 12/02/2003. The surveillance camera is pointed right at you. This photo shows a small dish below the second platform, pointed at roughly 105 degrees towards Badger Mountain. Photo taken on 12/02/2003. 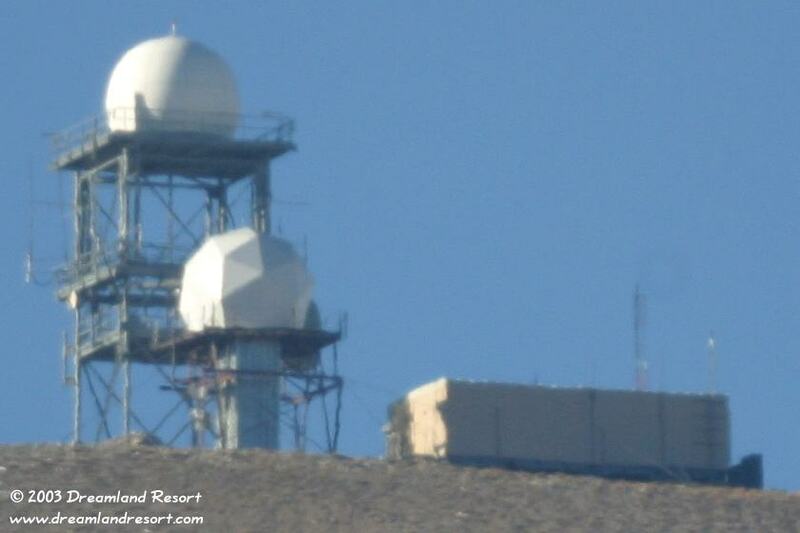 This photo shows another dish on the back side of the tower, probably pointed towards Area 51. The large camera is visible on the left, and what appears to be a smaller camera, about the size of the valley surveillance cameras, below it. 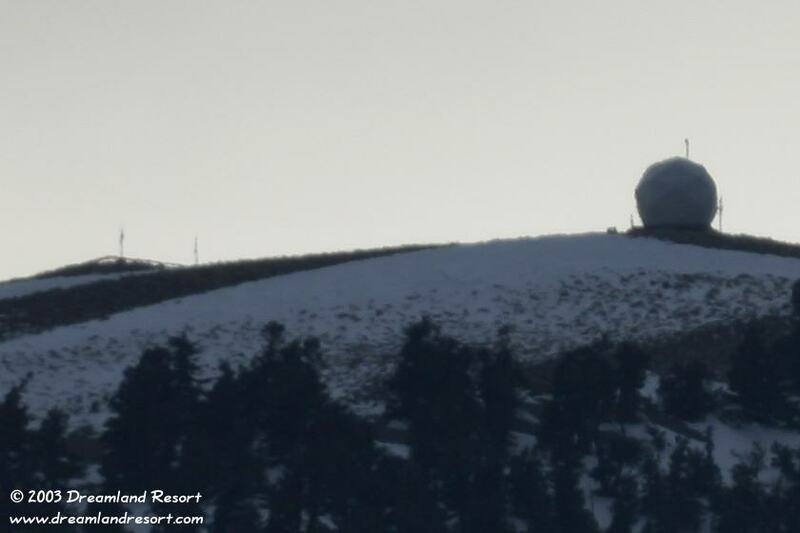 This new radar dome, located on a side-peak about 0.2 miles NE of the original facility, was added in October of 2000. Photo taken 12/02/2003. This photo shows a section of the above-ground cable conduit connecing the two sites on the left, and the new dome on the right. Also visible are a couple of smaller transmitters, that are similar in design to transmitter sites in other parts of the area. Photo of the old Microwave Relay Unit number four (MRU-4) on Bald Mountain from the early 1960's. MRU-4 was part of the X-15 High Range tracking network. Source: 1963 edition of the AFFTC Facilities Handbook (FTC-T1H-63-2003).